This book provides a stunning and revelatory overview of the causes behind the current world upheaval, and the immediate and long term goals of a well-developed Plan of Light for the transfiguration of our world. It explains how the world is being guided by a co-creative effort of humanity and an interdimensional Light Alliance. Together they are transforming the darkness on our planet, and supporting the emergence of a civilization based on love, aligned with a higher spiritual Plan. You will find startling new insights into the history and current state of the ancient struggle between the forces of light and darkness on our planet; the Cosmic decree from higher spiritual levels which is facilitating the inflow of powerful new energies and movements for planetary liberation; and a detailed outline of the unfolding Plan now being implemented for rebalancing our planetary life. This includes financial, political and media reforms, a more enlightened distribution of resources, the regeneration of the environment, and a renaissance of spiritual cooperation between humanity and the subtle spiritual worlds, including Galactic civilizations. Judi – Greetings everyone. This is Judi, the co-chair of the media group of www.prepareforchange.net. Welcome to our radio show for Sunday, March 22, 2015. It is my pleasure to introduce our guest in the studio today, Gordon Asher Davidson. He is the co-author of “The Practical Visionary” and “Spiritual Politics” and co-founder of the center for visionary leadership. He’s been a meditator, teaching meditation and courses for spiritual development in the US and Europe for over 35 years. Welcome Gordon. Gordon – Thank you Judi. It’s a pleasure to be here. Judi – Great. And we’re doing this interview today via Skype. I am delighted to come across your work. Actually Gordon, it was at the LA Conscious life Expo, I met Shima Moore, the manager of the Expo (Gordon: ‘she’s a friend of mine’). She told me that there were 2 particular speakers that she wanted me to know about and one was the Prageet of the TheStargateExperience.com, and the other was you and your book. She actually gave me the post card for the book. I have the book right here. Thank you for sending it to me. 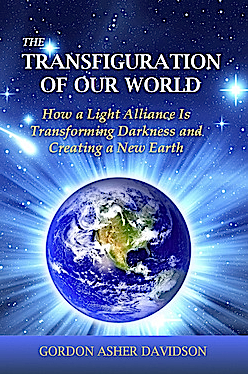 The book is: The Transfiguration of our World, how a light alliance is transforming darkness and creating a new earth. So for our worldwide listeners, I wanted to just share with them what’s on the back of the book. There’s a quote by Barbara Marx Hubbard, author of “Conscious Evolution”: It’s very important that everyone who’s interested in the future of our planet read this book. Another quote by Mark Krigbaum, filmmaker of Death makes life Possible, “A powerful book that will have a tremendous impact on human consciousness”. This book provides a stunning and revelatory overview of the causes behind the current world upheaval, the immediate and long-term goals of a well-developed plan of light for the transfiguration of our world, with many practical examples of how it is emerging. It explains how the world is being guided by a co-creative effort of humanity and an inter-dimensional light alliance. Together they are transforming the darkness on our planet and supporting the emergence of a civilization based on love, aligned with a higher spiritual plan. That sounds wonderful to me Gordon! Judi – So, I found the book to be very very easy to read and I thought today I’d like to introduce your book to our worldwide PFC groups. We have many that are springing up all the time and our team of translators have told me that they would like to translate our interview today into many, many languages, so I’m delighted that that is going to happen. Now, could you share with us a little about the source of this book, which you describe as 20 years of contact and inner telepathic guidance from a master in the inner ashram of synthesis? Gordon – Yes, this has been something happened for me. It began about 20 years ago and I have been receiving detailed information and guidance both about the world situation and also suggestions and plans for things that I could implement in the world, which I have done and I have found it to be extremely reliable and very accurate about the situation in the world, and about two years ago, I started getting very detailed input about how the world came to be in the situation it’s in. What is going on today, the deeper reasons for all the chaos and upheaval and a whole very big vision for how this is unfolding and where it’s moving towards. That was really intended for me to put that all into a book. I did a tele-seminar first, with a group of people all over the world. I did several tele-seminars, and then we created this book and put all the materials from that into it. It was really . . . I was asked to do this. It was really . . . I have a pretty main-stream back-ground in social investing and being involved in Washington DC and doing all kinds of things. So this was a huge leap for me to go into this kind of work publicly. I had done some of this in a quieter way, but it took a lot of convincing to get me to step out here and do this but I’m extremely glad I did. Judi – We’re extremely glad you did as well. You write in the introduction that ‘the course correction currently being applied by humanity and the spiritual powers working heart to heart and hand to hand together will guide our civilization into a new life for our world, where our planet and all life upon it will be living in alignment with cosmic principles and actively co-creating with galactic life itself.’ Now, there is a blog called www.2012portal.blogspot.com. Cobra writes this blog. He has recommended global meditations and you also have written that . 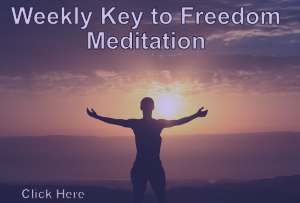 . . “worldwide meditations are proliferating all over the world to support and distribute the higher energies pouring into our planet.” Is this process working with global meditations do you think? Gordon – Absolutely it’s working. I mean . . . I think it would be helpful to understand the larger background of why it’s so powerful to do these meditations right now. I’m going to give you a little context for that. (J: please). So what we have is and as we all know, there has been a Cabal that has had major amount of control over our planet for quite a long time – many millennia actually. These beings have set-up a system of controls, this goes back throughout history and have been able to exploit humanity and this planet in a very detailed way for their own advantage. And the spiritual masters have been working throughout history to provide a better vision of how we can move forward and evolve and the whole situation has really been allowed to continue so that humanity is presented with a choice. We have a choice to go the way of selfishness and greed and all those things, or we can choose to go the path of light, sharing and giving to others. That’s the basic choice we’ve been faced with throughout our evolution, and it’s been very beneficial for people to learn from the results of their choices and learn to make better choices in the future. That’s really our goal and so what happened was, with the event of 9-11, which was a very clearly orchestrated event to create more fear and gain more control over our planet by these forces, they actually created the situation where the planet was just about ready to be fully taken over by these forces because they had passed the Patriot Act, they had control of the media and the financial system and all these things. This was after 9-11. What happened was, because our earth is a chakra in the body of the greater Solar Being, because every planet is a chakra in the Solar Being’s body, the condition of our earth with all this darkness controlling it was preventing the forward evolution and progression of our solar system to a higher level of energy. This is a very important point. So what happened was, after 9-11, at the level of the Solar Council, because there are councils at that level, they looked at the condition of the planet and realized we were not going to be able to free ourselves without some additional support and help. They made a decision, it’s called The Solar Decree . . . to remove the leadership of the dark side off of the planet, which they did. The way they did this was they gave Galactic Civilizations the permission to go ahead and take (them) off, or turn to the light those beings who were the foundation point of the whole dark side and they were removed over the last years . . . relatively soon after 2002. It’s been going on for a while. They have been completely removed … that alien leadership. However, we still then have the human beings who’ve cooperated with them all these years. They are in process of being awakened and turned into understanding what is going on. The other thing that the Galactics were allowed to do is increase the amount of light and love and powerful spiritual energy, they were allowed to radiate to our earth and to increase the support they could give directly to help move forward the process of our liberation from this whole control system. That’s the reason why, one of the reasons, one of the factors, in why there is such an increase in the level of light and energy pouring into this planet. This is a long response to your question. About worldwide meditation, but I wanted to give it some context. Judi – I appreciate that. So Gordon, how does the plan that we are in the process of today on earth parallel the process that Jesus went through, called The Transfiguration, the powerful experience that he went through when he was radiant with light on the mountaintop? Gordon – Yes. Because that idea of transfiguration which is a description that I’ve received . . . the way the higher beings talk about this, is that the idea is infusion of light, higher frequencies of light energy which is called atomic light substance into our whole being at every level. It’s on the spiritual, the higher mental, the emotional, and the etheric and physical levels. Every level of our being and the planet being infused with this higher frequency light which raises up the vibration as you know, of everything, and allows us to function at a new level of consciousness where we can actually perceive our unity and recognize we are actually divine beings, divine creators. Judi – And who of the masters and enlightened beings in the spiritual hierarchy? Gordon – These are beings who have gone through the human reincarnational experience all the way through. Mastered every level of abilities at the etheric, physical level, the emotional level, the mental level and the spiritual level. In a sense they have graduated. They no longer have to incarnate. They can create their bodies of manifestation at will . . . and they are working from these organized inner groups which we call Ashram’s on the inner planes radiating love, ideas and organizing and helping to clarify what do we need to do next in our evolutionary process and giving guidance and suggestions to different people about what they can do to help. Dov – Hi Gordon, this is Dov. I was wondering in your book, you explained about transfiguration. It seems to be a word that is not as popular as transmutation or transformation. Can you explain the difference between those 3 processes? Gordon – Certainly. Transformation is moving at the form level, at the level of our physical body or emotional body, mental body – changing the form. So that would mean changing the thought forms in our mind, the emotional state that we normally radiate or the energetic field in our energy body. Moving those form levels of our being to a higher more inclusive energy. That happens after transmutation which is where we take a lower energy and we move it into a higher. Then we have transformation, which is when the form of our being starts to change. We start to operate at the form level you can see the change in people. At the level of transfiguration we are actually bringing in much higher frequency, light and energy from even beyond our normal soul consciousness, even from beyond, you know, where we normally function – at the highest level of our soul. We bring in this other higher light, which I call atomic light substance and that comes into your whole being and really starts to raise your frequency at a whole other dimensional level. Does that help? Dov – Yes, that does. So bringing in the word ‘transformation’ – would that be with our bodies? Would that be the way to work on our bodies to be healthier? Gordon – Absolutely. You know most people when they start to wake up, they realize that their body’s frequency, that it resonates on, is affected by what they take into their bodies, and by that I mean, of course food, and the quality and healthiness of the food they eat. But also people aren’t as quite aware of what you take into your emotional body and what you allow in. What you give your attention to in the kind of books and movies and TV shows you watch and what you take in there, is just as important as the food you eat, in fact in some ways more important. And then the ideas that you actually focus on, and the thoughts you allow into your consciousness, that’s also the part of the transformational process, really becoming very, very aware of what, what is going on in your mind, and when you see thoughts there that you don’t like, actually making a conscious effort to change them. Judi – We were speaking about that yesterday. Some of these video games that the teens are playing these day where they are encourage them to . . . you know. . . what were some of that – violence etc. I think that’s having an effect on the consciousness on the planet. Gordon – That’s part of the Cabal’s MO. They do this. The media is right now under the control of the Cabal for the most part. Not completely, but a very high percentage. That’s the kind of things they do. Video games, all the movies that create fear and violence. The underlying thing is to create the image of a human being as violent, filled with negative tendencies, untrustworthy and governed by all these lower drives and that creates an image so that people become fearful of other human beings and therefore they don’t cooperate. They don’t trust each other. That’s part of keeping us all split and separate so that our power is diluted. Dov – So the image of a human being as a divine reflection, as divine and connected to the source, that image is something maybe people need to identify with instead. Gordon – Absolutely. And that is the emerging image of the human being. We are divine beings. We’re part of God. We are God in essence, not to the same level of consciousness, but at the essence of our being, we are divine beings. The highest form of divine expression is creation. That’s what God does, he creates, so we can create and express our divinity through our creation. Dov – We’re looking to the media for that. The media often creates an outside enemy or someone that we have to look outward. Isn’t it something to look within to find that part that we can change? Gordon – Absolutely, absolutely. I mean the most important thing for all of us is to go deep within ourselves, to spend as much time as possible meditating, tuning into our own being. What do we feel about things? I always like to ask people when you experience things, look at what, when you do it, what raises your frequency? What makes you feel better, after you’ve done it? And what lowers your frequency? And really paying very close attention to that . . . is extremely helpful in knowing how to orient your attention in the world and keeping your attention within yourself to see how things are affecting you. Judi – So we’re back from the ‘Sea of Tranquility’. You can hear more of Dov’s music on The Earth Harmony Channel on youtube. Gordon, could you tell us a little bit about the galactic wars and the formation of the Alliance of light? Gordon – Yes. Well our galaxy for very long cycles of time has been punctuated by interplanetary conflicts and wars. This went on for a long, long time in our galactic history but eventually, however, the light forces gained supremacy and they have formed many alliances in the process of these wars and all those different existing alliances were woven together into the Galactic Alliance of Light, also known as The Galactics. The Light Alliance is in agreement to keep the peace and uphold the principles of freedom, self-chosen development and evolution of each planet and system and friendly relations between all races and civilizations. That is the galactic alliance. That has been very much present in our galaxy for a very long time and that galaxy was protecting our earth, from the very beginning of it’s creation, which was such a place of incredible physical beauty and abundance and it was meant to be shared by all the lives on the planet, however there was a time space anomaly, a kind of warp in the continuum, and a group of aliens were able to enter into the planet and establish themselves here, but they were relatively quickly discovered by the light alliance guardians and a huge debate ensued about whether they will be removed or allowed to stay here. And it was decided at the level of the solar council that it would be beneficial to have them here on the planet, as they would stimulate our evolution by causing us to make a choice between light and dark. So throughout our whole evolutionary history. And that is exactly what has occurred. So they’ve been here a very long time and they’ve organized themselves extremely well, and they enlisted many human beings as their co-operators and collaborators because they had some powers that human beings do not have, like telepathic control and a certain degree of pre-vision and this allowed them to really set up systems where human beings help them to set up these control systems. Judi – You write in the book that the original alien group, comprised of about 50 beings and that they were not able to reproduce themselves. Did they interbreed with humans? Gordon – Yes, to a degree they did, yes because they were shape shifters. Dov – So, do people in general feel in their hearts and their souls the direction? Do they get telepathic messages to decide how to work with the Galactic Alliance and in co-operation? How does that communication work from this Inter-Galactic council to individual humans like ourselves? Gordon – Yes, yes. Very good question. What happens and has been happening throughout our history, there’s always been individuals who have been able to communicate telepathically with these higher galactic beings and spiritual masters, of course who are also helping and working for our planet, and so that’s been going on for a long, long time. However, as we have evolved and as our frequency continues to rise, it becomes easier and easier for more people to make that contact and telepathic communication with both the galactic light alliance . . . with the spiritual masters and many other guides who are helping human evolution. So that is increasing rapidly, and there are people on the planet that have actually, have actually met in physical form, galactic representatives. There have been some. That’s also happening as well. And people have been taken onto ships and you know, given information and a vision of what their work is. That also has happened. Not huge, but there has been quite a fair amount of that. The primary thing now is telepathic communication. Dov – And I’m wondering about the other dimensions. You know how nature sort of, is in charge of this material world that we see and patterns such as rainfall, creating rivers and canyons and rivers create canyons and that’s centuries and centuries of patterns. Are there things like that in other dimensions? Where energies create rivers of thoughts and rivers of actions, or how does that work? Gordon – Yes, yes, absolutely. I mean, you know Christ said: In my father’s house, there are many mansions. What he meant is there are so many dimensions that are present, there on the inner planes, a vast number of them at different frequencies, so people who, whatever resonance frequency you’re holding in your normal thought patterns, in your feeling patterns, as you go through your life. Those are the dimension that you will naturally resonate with on the inner planes, so that determines where you go at night when you sleep, it also determines where you go when you pass, when you leave the body. That dimension that you naturally resonance frequency, that’s where you will be focusing at those times. (Right). That’s an important consideration in terms of planning your future. Dov – So the word mansions sound like dimensions, that’s a very similar word. Gordon – Yes, yes exactly. So each of them has specific function that there are many levels on the etheric levels. There are many levels on the astral plane, where people, whatever they desire to experience is what they’ll experience, and many levels of thought and insight on the mental plane and on the spiritual planes . . . it becomes a revelation of greater and greater pulls . . . and greater and greater plans and vision of what life is all about. Judi – Gordon, you share in your book that these dark ones began their controlling influences back in Lemuria. Now, I was born in Fiji, and I grew up in New Zealand and Australia which, I believe is the remnant of what was long ago a huge continent named Lemuria. You write about how the Cabal back in Lemuria used psychotronic technologies using combined psychic and technical means, on the inner planes to create veils around the planet. What was the reason that they wanted to do this? Gordon – Because they wanted to make it very difficult for human beings to access the spiritual source directly. The whole idea is to create like a shield between us and the higher dimensions so it would be very difficult for people to make that connection. The more we make those connections, the more we realize that we don’t have to be in fear, we don’t have to follow all … and submit to all this control. We become autonomous, spiritual liberated human beings. That’s exactly what the Cabal does not want. So they try to shield and make that connection more difficult than it has to be. Judi – Right. So the presence of the dark ones in Lemuria resulted in conflicts between Lemuria . . . and Atlantis and Lemurian civilization disappearing and Atlantis becoming corrupted and destroyed. Was the fall of Atlantis the flood described in the Bible? Gordon – Yes, exactly. What happened when Atlantis was, the civilization became so corrupted that it was not salvageable, because the dark forces infiltrated all the systems, and the priesthood, every dimension of society and a decision was made at a very high level that the civilization had to be eliminated in order to cleanse all the corruption. Judi – You describe the efforts of the Galactics and other light forces to intervene in our world. Can you elaborate in this in regards to chemtrails and Fukushima in Japan? Gordon – Yes. We have had these chemtrails going for quite some time in at least in the areas that I’m in touch with. They have been diminishing, and that’s a very important sign that the Cabal is loosing it’s power and loosing it’s resources. The intention of them was to actually create chemical and particles and things into the atmosphere that interfere with our health and with our well-being. However, the galactics have been very actively neutralizing all these negative effects for a long, long time and they are actually videos, I’m sure you know of where you can see the chemtrails and you can see the galactic orbs going in and cleaning up the mess and neutralizing it. And they have been doing that and they continue to do that and the chemtrails themselves are diminishing for sure. With Fukushima, they also of course have the technology to neutralize radiation and they have been doing that, although and they’re still working on that. It’s not totally and completely neutralized but it is far, far reduced than what it would have been if there was no help from the Galactics. And I’ve been told that they will be successful at neutralizing all that radiation. Judi – How can a person heal the fear of darkness within and in the world using the power of love? Gordon – Love of course, is the most powerful energy in our system. And when we connect with that it’s like a matrix that we actually connect into through the different portals in our being and realize that that matrix of love extends throughout our entire human community throughout the planet and the solar system and galaxy. It goes on and on. In order to utilize that in our own being, the place where people suffer the most with these tendencies that they don’t want to have in them, is because there are patterns in the sub-conscious that are present which interfere with being able to fully implement your higher vision for your life. I’ve done a tremendous amount of work with this over the last 10 years of helping people clear and remove the patterns in their subconscious that actually are causing them difficulties. And that has to do with learning to love your subconscious. To actually understand that it is a wonderful part of you. It is actually trying to help you but some of the ways it tries to help you are not really truly beneficial. Dov – Is there a symbol that we can use to communicate to our subconscious such as the ocean and the vastness of it? Gordon – hmmm. Well in my experience, and I’ve worked with hundreds and hundreds of people all over the world. The most powerful thing you can do to communicate with subconscious is to send it love. That means send love from your heart – bringing in the soul energy, bring it in your heart and send that love down to your solar plexus center because that is where the subconscious communicates with you and actually radiate that love and appreciate your subconscious for all it’s doing to try and help you and have gratitude for it. It really responds to that. You can open up a line of communication that allows you then to process and work with whatever patterns you’re finding difficulties with in your daily life. Dov – That seems really good insight. As far as other people, sometimes we are relating to them, not only on their conscious level, but also on their subconscious level. Is that something we can do with each other? Gordon – Absolutely, absolutely. The more we are in a good positive relationship with our subconscious and really in communication with it, the more your subconscious will start to transform and become more light and when you contact other people their subconscious is always connecting with yours, so when they see your subconscious has got more light within it and is happier, they will want what you’ve got. How did your subconscious get to be so happy? Their subconscious will really want to, will want to spend more time with you and interact with you because it’s learning by observing your subconscious. Dov – So there’s a part of all of us that is intelligent looking to be happier and when we see something that we want, something that makes us happier, we find a way to employ that? Gordon – Yes. Exactly. In your subconscious does want you to be happy. It is also very concerned about you being safe, secure and not experiencing any harm. So it’s always trying to protect you. And that’s a useful function. Judi – Gordon, I understand from your book the Decree stating earth and humanity must be freed from control of the dark forces. How has this process been going, do you think? Gordon – Oh, it’s going fantastically well! Keeping in mind that the media is controlled by the Cabal still, underneath the surface, there is a tremendous amount going on, in implementing this plan to free us from all this control. Of course, you know, I saw one of your videos about the financial control system through the Federal Reserve and all the other kinds of things that are being done with finances. That is one of the primary areas where this whole struggle is oriented and there has been a tremendous amount of upheaval and transformation going on in the financial system. Just as a fact that’s very interesting, in the last 2 1/2 years over 2,000 CEO’s, CFO’s and other leaders in the financial world, hedge funds, banks, mutual funds, all these things, have either resigned, been indicted or disappeared. That is 10 times the norm the rate of turnover and that’s because there’s so much pressure from the light alliance being put on the financial leaders to change and to move into this new system where we will eliminate interest based money. We will have a whole new way of organizing our banks. They will no longer be ‘for-profit’ companies. They will be, ‘not-for-profit’ companies, they will be like public utilities and they will actually function in a completely different way and we will eliminate interest based currencies from our system, which is one of the most profound ways the control is exercised. There are light alliances working in every field, in every part of human culture and civilization and there are many, many peoples, some whom I know, are working behind the scenes, setting up the plans and the ways of implementing the new civilization, once we are ready for this. Judi – Now in your book you write about the new currency, the golden Real. A gold backed currency. Could you speak about this? Gordon – Yes, that is the idea that we will have a new currency, backed by gold and commodities that would actually . . . all national currencies would be convertible into this new currency, but it would stabilize the whole financial world’s systems because it would be solid, stable, predictable currency that we can all rely on and we would not have all the speculation games being played in different currencies. Judi – People have wondered if there will be a distribution of funds to help humanity. Do you foresee this? Gordon – Yes. That is what I did receive that very, very clearly. Huge amounts of money that have been confiscated illegally by the Cabal and through their manipulation of those different systems, including the financial system. That massive accumulation of money and I’m talking about quadrillions and quintillions of dollars, would be confiscated and made available to help the basic regeneration and rebuilding of the earth, provide housing, food, shelter, healthcare, education to every single human being on the planet. Judi – So I think we’ll take a little break. We’re going to listen to some more music from The Earth Harmony Channel. (music) And when we come back I’m going to be asking you about the Light Alliance and the Day of Revelation. (yes). Judi – So the music we were listening to was from the Earth Harmony Channel on youtube called Mermaid’s Caverns. Now we’re back in the studio with Gordon and we’ve had two www.prepareforchange.net member’s join us. Raissa and Sophia. Welcome. Gordon, in your book you write about the light alliance and the day of revelation. What is the day of revelation and I’m wondering if this ties into what Cobra calls the event, and many other people are calling the event. Can you elaborate? Gordon – Yes, yes. What I’ve received is . . there is a very extensive plan that is already put on by many, many nations all around the world, including some heads of state and other world leaders for the transition into this new, this whole new way of organizing our planet, a whole new civilization and of course making this transition is fairly challenging because there are a lot of systems to manage that will have to shift. What I am getting is the day of revelation is going to be determined by a specific time when there is going to be a release of energy, which will be determined by the solar council, to our planet, which is going to be the most complete and high frequency release of love we’ve ever seen on this planet. And it is going to move the, raise the frequency to a very high degree, and that’s determined by the solar council so that’s why it’s not really clear even to the masters and at least in my communication exactly when this is going to happen, but it’s not going to be decades in the future. . . This is coming. And so what happens is when that energy floods the planet with this very powerful love energy, anyone who is not able to vibrate to the frequency of love, who is not able to at least understand that love is a fundamental principle. People don’t have to be perfectly loving, and all saints or anything like that. But anyone who is able to recognize Love as a frequency and to work with it will be able to accept and absorb and work with this energy. Those people who are not able to do that, just because they are not in that reality, that frequency, it’s not their experience, they’re locked into all the lower 3D patterns, will not be able to remain on this planet. Dov – So is it challenging for people sometimes to experience this love frequency which seems to be a real thing because we get caught into emotions and dramas and things like that. Is there a way to still ourselves, and actually experience this? Gordon – Yes, yes. That’s why of course meditating, allowing this love energy to flow through you even now, all the time ,as much as you possible can, which also helps to cleanse and remove and purify those other lower tendencies which we get caught up in. That’s very, very useful to do as well as working directly with those patterns as I’ve suggested earlier. When that love energy really pours into the planet, it’s going to be, that’s the day of revelation. That is when we will see who is vibrating and capable of vibrating at that level at all, even the slightest bit, or those who are completely locked into hatred and violence and all the other things that are going on here. They will not be able to remain on the planet. Dov – So love is something that is within, the Kingdom of God is from within, but it’s also coming from external sources too? Gordon – Well, yes in the sense, but what is external to us, if our consciousness is really comprehensive, it’s all within us too. (That’s right). Judi – So Gordon, in your book you write: ‘On the day of revelation there will be a world wide holiday and announcements will be made from a central location, possibly at the United Nations or another site’. Could you comment on that please? Gordon – Yes. I mean the thing that humanity is suffers from now is massive amounts of dis-information which has caused tremendous confusion in humanity about what is happening on the world, in the world right now, where is this all going. That is really clear. What will happen is there will be a very clear statement made through all the media simultaneously, worldwide about exactly what is happening when this occurs. What it’s purpose is, what it’s intention is, and to actually reassure people about the benevolent intention, and this will be worldwide in many, many languages. There will also be a continuous broadcasting of over 40 hours of pre-recorded media explaining – this will be done by the galactic alliance and the masters – explaining the entire hidden history of our world, of our earth, what has happened explaining what the Cabal is and how it has maintained it’s control, and what is happening now and where it’s intended to go, so that people will no longer be operating in this confused, deliberately misleading where they don’t have clear information about anything. It’s just a big mishmash and people have to sort through this massive amount of stuff on the Internet. 3/4 of which is dis-information and then try to figure out what is true in that and it’s so difficult for people to get any clarity, so this will be all cleared up. So there will no longer be this kind of confusion, which will be tremendously liberating. The other important thing that would be really liberating, is, if people know, if people know that they’re going to have enough to take care of their financial needs and that they will provided for. If we take interest out of money, the price of everything on the planet will drop by 50%, because 50% of the cost of everything is interest. When that happens, plus people have more money available to them, and they know this is going to continue, what does that do? It eliminates the sub-conscious survival fear, which drives the planet and is causing so much anxiety and fear and gives the dark side an ability to control humanity. When that survival fear is gone, that’s the real moment when we will experience what it means to be truly liberated and that’s going to happen! Dov – Is any of this being implemented gradually? Gordon – Right, we’ve already had, there are funds which I’ve been involved in, where people loan money to developing countries at very low or no interest. That’s part of it. There are people who are providing resources worldwide for development in developing countries. There’s so much going on in this realm. It’s huge. Loan funds, community banking where they loan money to women to create businesses. All of this stuff is going on, so this is all part of it. Gordon – That’s it. That’s what you’re all about, what you’re doing right – preparing people for that . . .
Judi – Yes, prepare people for change. They are other groups all over the world that are feeling this energy and are already being the change they wish to see in the world. They’re actually being it right now. Dov you wanted to say something. Dov – Banks would earn money and profit other than interest? Gordon – They would charge a fee for loans but a very reasonable fee, I mean compared to what it is now of course. If you buy a house with a 30-year mortgage, you pay for the house 3 times over. That’s just not going to be there any more. And they will be like public utilities and not trying to make huge profits, they’re just trying . .
Dov – CEO’s won’t have to have 30 million dollar bonuses? Judi – Many people like David Wilcock have been writing and speaking about mass arrests of key figures for quite some time. What do you see happening in this regard? Gordon – It’s very interesting because in my book, that book is based on a series of tele-seminars that I gave over about a year. In the beginning there was a lot of talk of mass arrest. Later on as we moved through the process, there was less and less emphasis on the mass arrest and because if this day of revelation as it comes down the way I’m describing it, there won’t be a need for mass arrest because the people who do not vibrate at the frequency of love will not be able to remain on this planet and by that, I mean, they will pass out into other dimensions. They will be moved to locations on the inner planes where they can evolve at the frequency level where they are. Dov – That goes along with 9-11 and other things that have been done to societies that eventually love, not only does it create something that we want, but it also takes care of what we don’t want. Gordon – Yes, yes, beautiful. That’s absolutely right. Judi – Gordon, can you talk about developments in the media, such as in your book you talk about Wiki-Leaks exposure of the details of the Trans-Pacific partnership negotiations showing the proposed agreement would only give more power to corporations and eliminate environmental protections. Gordon – That’s right, that’s right. And that is one of many, many schemes that the whole Cabal has been trying to put into place for a very long time as there are many others and that one is falling apart now because of the rift between the European Union community and the US and I just read something today that partnership now looks like it’s not going anywhere and that’s because the upheaval that’s going on in the financial world, which is in dire straights because it doesn’t have the money any longer, they can not keep printing or creating money in computers as they have been, because the light alliance has gained more and more foot-hold and control in the financial system, and has shut off the sources of their funding. That’s why there is such a huge crisis in the financial system. Dov – Can you give us a clue how the wars are going to cease and how all the huge resources that’s going towards that, and is taking away what it could be helping people and protecting our environment? What is the process of ending war? Gordon – Well . .. There’s something very interesting is just happening, but some of the leader of ISIS, the group in the middle east had a experience, a vision of Mohammad came to him and told him that they should withdraw from one of the Mosul, I think, the big capital of their new caliphate. That is one of the ways they’re being directed inwardly to basically stand down and that is in process now. And also, it’s going to be, if that love energy floods the planet, people who cannot vibrate with it will not be here. Once that’s established, you know, the idea of going to war will be as ludicrous as it always has been but people will fully understand that it is ludicrous and it’s not in any kind of higher plan for us or the right thing ever. Judi – We’re coming to the end of our interview today but I wanted to close with this beautiful passage form your book. You wrote: “Once a sense of safety, security and well being is established many of the unresolved subconscious issues within humanity will be lessened in their intensity. There will be classes helping people to understand their own nature, how to improve themselves, grow spiritually; become happier and more productive contributors to the whole. Then these will be established in every country.” Wow, Gordon that would be amazing. What other changes, positive changes do you see taking place? Gordon – Oh There’s so many. One of the key things that will happen at this time will be the emphasis on the regeneration and reconstruction of our planet in the ecological systems, so there will be a huge work done to clean up the oceans, clean up the waters everywhere, to clean up the environment everywhere, and to re-build and re-garden the whole planet. If we have free energy, which we will, then we will be able to create desalinization plants all over the world, have plenty of water to turn the middle east into a garden, to turn the whole world into a beautiful garden and restore the planet to what it was meant to be in it’s beautiful pristine condition with the help of the galactics who have the technology to purify and remove all of this pollution – and they will. Judi – And what do you feel is the role of Russia, of Putin in Russia? Gordon – Putin is very controversial and I understand that. And he is a being who is fully aware of the light alliance and he is participating in it. He of course has been smeared by the west, the western press. He has a certain kind of nationalistic element in his being where he wants to have Russia re-assert itself in that way, but he does understand the whole dynamic of the light alliance, the Cabal and all the rest and he is working and supportive and the whole story of the Crimea is different than what is portrayed in the west. We don’t have time to go into it, but it really is/was an attempt by the Cabal to get their hands on the resources of the Crimea through the government they were trying to establish, so this is a lot of complexity in it. He is basically in the light alliance and the BRICS nations. . . Brazil, Russia, India, China and So. Africa are actually the foundation point for building the new financial system and if we just had the wonderful news that Italy, Germany and France and Britain are now joining the Chinese in the new bank – their international development bank to work with them, which sounds the death nail for the IMF and is a major step in creating this new financial system. Judi – I agree with you there, Gordon. If people would like to learn more, I think they can go to www.worldtransfiguration.com and how can people purchase the book that we’re speaking about today, the transfiguration of our world? Gordon – The Transfiguration of the World book is available on Amazon and the new edition just came out so they’ll get the second edition. It’s just expanded with 4 additional chapters. I also have a tele-seminar that’s on-going. It’s been going for awhile and you can participate at any time. I have videos and transcripts of all the sessions that you would get if you’re interested. To find out about that go to www.worldtransfiguration.com and all the information is there about it. Judi – It’s been an absolute delight to speak to you today via Skype with Dov in the studio. We both want to thank you and the whole entire round-table of www.prepareforchange.net would like to thank you. Perhaps we can have you come back and speak with us on a future show. Gordon – I would love to. I just want to say how much I appreciate all of what you are doing, your group. I’ve read your web-site and listened to video’s and I think you guys are doing great work and it’s very aligned with everything that I’m getting and I feel like we are totally in sync and in the same vision and future and purpose for our planet. God Bless You. Judi – Thank you and on that note I’d like to end with Dov’s beautiful Global Anthem: Voices of the World. Dov – did you want to say anything. Dov – We’ll play that. Thank you Gordon, I appreciate you for holding the vision for us all for a brighter world.